In honor of the current exhibit "Vodou: Sacred Powers of Haiti," the Field Museum recently asked several local bartenders to create cocktails inspired by the spirits of Vodou (the most common spelling of the name of the Haitian religion; it's also written Vaudou, vodon, Vodun, Voodoo, or Voudou). Known as Lwa (or Loa, or L'wha), the spirits appear to have very specific tastes and preferences. According to the Field: "Many Vodousists serve their Lwa by offering them food and drink, wearing their colors, and holding lively special ceremonies. Four Lwa, who have a love of popular drinks, were carefully chosen to help shape these intriguing cocktails." 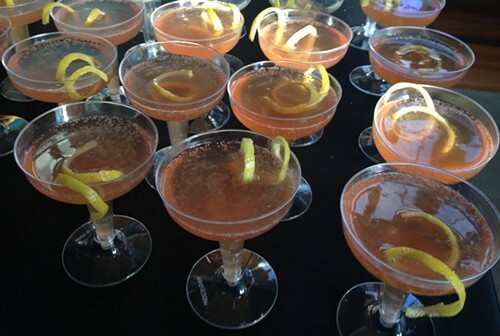 Each of the nine participating bars—Barrelhouse Flat, Bar Pastoral, Geek Bar, Henry's Swing Club, Italian Village, Rogers Park Social, the Boundary, the Grafton, and the Signature Room—will offer a cocktail created in honor of one of the Lwa. At a press preview earlier this week, I tried cocktails inspired by Danbala, Erzulie Freda, and Ogou Feraille—no one seemed interested in the Marassa Twins, who like to drink soda. 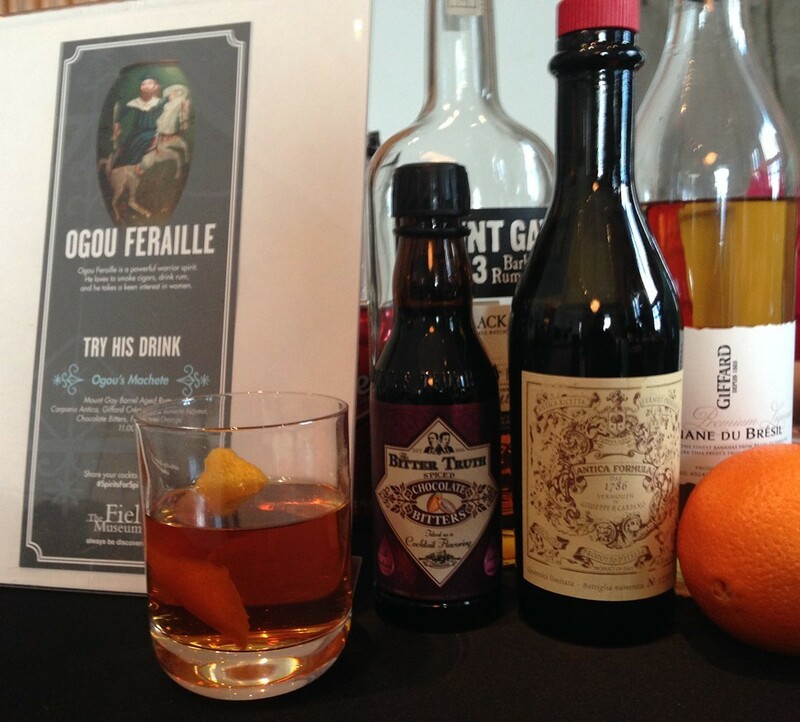 Ogou Feraille, the warrior spirit who "prefers strong drinks like rum," might very well like Geek Bar's Ogou's Machete. Made with Mount Gay barrel-aged rum, Carpano Antica, Gifford Crème de Banane Liqueur, chocolate bitters, and flamed orange, it's indeed a strong rum drink (though because of fire code, the orange peel couldn't be set on fire at the Field Museum). It's a boozy, tropical-tasting concoction, but a little too sweet for my taste. For Danbala—the spirit of the snake, who likes milk, coconut milk, and white drinks—the Boundary created a cocktail with Stoli Chocolat Kokonut, Kahlua, and cream. Called Danbala's Milk, it tastes like a classic White Russian (which was the bartender's intention) with a touch of coconut. The Barrelhouse Flat's bartenders also used Danbala as their inspiration, creating a riff on a horchata-based cocktail they already had on the menu. Their Horchata Borracha includes almond and rice water, Cruzan Black Strap Rum, El Dorado 12-Year Rum, Lemon Hart 151 Rum, cream, sweetened condensed milk, and orange flower water. It turned out to be my favorite of the bunch, light and creamy and dangerously easy to drink. The almond worked surprisingly well with the complex flavors of the rum. For its cocktail, Rogers Park Social looked to Erzulie Freda—"the Lwa of love, flirting, romance, and luxury, who loves pink champagne and other sparkling wines." Freda's Floral Sparkler is a Haitian riff on the French 75, with 4-year-old Rhum Barbancourt, lemon juice, sugarcane syrup, Varichon et Clerc sparkling rose, Peychaud's Bitters, and orange blossom water. It's another winner, bubbly and not too sweet, with a lovely orange blossom smell and a slightly tart finish. The participating bars will offer their respective cocktail specials through February 28 (the exhibit continues through April 26). Anyone who orders one will get a coaster for $5 off admission to the Field Museum.